Karl Heinz Borchers has sent in a report on the third MG-Y Sommertreff im Bergischen Land. Although only a small turn out it looks like a really fun time has been had again by all who were lucky enough to get there - just make sure you are one of them next year to join in the fun! Coming up soon will be the Australian T and Y Weekend (4-5 September 2010), and UK MG Car Club inaugural Autumn Run (5 September (5 September). If you are not signed up for either of these events please contact the organisers - details can be found on the Events page. Hopefully soon we will be able to add reports from the UK MG Car Club 2010 Spring Run, and the 16th Annual Ripon Old Car Show? It is with great sadness that I inform you all that Bill Wallis died on the 22nd August after an illness, borne with great fortitude. 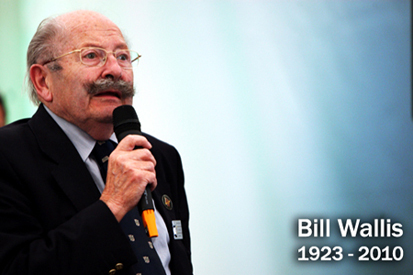 Bill was an enthusiastic supporter of the MG Car Club and a friend to many since joining in 1949. Bill served with distinction as Chairman of the MG Car Club from 1980 to 1985 but he will be remembered most for his role as President, a post that he has filled in every sense of the word since 1996. He was unanimously elected each year at the annual AGM and this was no surprise to anyone who was privileged to know him. Our thoughts and prayers are with his ever supporting wife June and his daughter Louise and family at this sad time. If you knew Bill and would like to add a tribute to the page set up by the MG Car Club for tributes to him you can email them to Chris Seaward here. It is always a pleasure to help Y Owners and never more so than when a new resource becomes available on the web. Today the long awaited return of the technical prowess of John James's pen returns. John is well known in T-Type circles already and has helped many T-Type owners with their rebuilds and in a selfless effort to continue this, John has now released a website TTypes.org at which you can subscribe to his free on-line technical publication Totally T-Type2. A permanent link has also been added to the Links page. Today, please welcome Mike Ash with Y 6244 to Ys on Parade. The mid-month Reprinted Article has been posted and is the fourth of four articles from The Autocar, 9 May 1947 and is entitled "Meet a New MG". Please welcome Ken Whitehead with YB 0940 to Ys on Parade. Today please welcome Dr. John Scott with Y 0674 to Ys on Parade. A new film has come to light that includes an MG Y - the 1991 version of "They do it with mirrors" - and been added to the Ys on Film and other media page. I have just returned from NAMGAR (North American MGA Register) GT-35 in Wisconsin USA where the featured model was the MG Magnette Series Z. It was an event of the first Magnettitude with 31 ZA, ZB and ZBVs present. Of more interest to Y onwers though was the presence of Bill and Lorna McReaken (Y 4465) and Skip Hahn (YB 1509). Bill and Lorna's YA won the Best Other MG category, and Skip Hahn's YB the prize for the Best Preserved MG. Well done guys and great to see you flying the Y Type flag! As soon as my luggage (and camera) catches up with me Skip will be joining Ys on Parade, however Skip has a very original period transistor radio fitted to his car and the instructions can be found in the Collectibles. Also there was MG Y owner Mike Ash with his MGA and I was there with my 1955 MG ZA - great to meet everyone. The Reprinted Article is taken from from The Autocar, 29 September 1950 and is a journey through Dovedale, UK with Michael Brown. This month's Picture of the Month page comes from MG Event of the year Auvergne, France 2006.